In 1996, Ray-Z put up a small site about Power Rangers Zeo. It grew to include bios, episode guides, etc. One year after that Ray-Z did the same for Power Rangers Turbo. They seemed to be moderately popular, so he kept doing it for Power Rangers series as they aired. Around 1998, Ray consolidated all sites into Power Rangers Central, which backtracked to include MMPR. Shortly after, a guest-book was added to Power Rangers Central. More and more people were leaving messages, even conversing with each other via guest-book entries. So the guest-book was ditched and a message board was added, which ran on "Coolboards". Power Rangers Central was getting good traffic at this point, so the Coolboard was widely used, albeit by retarded AOL and WebTV users for the most part. The community eventually outgrew Coolboards, so Ray set up a PRC EZ-Board. We were on EZ-Board for a while, but eventually the cost to keep it up plus the havoc wreaked by Poweranimals made Ray search for something better. PRC was on its own server at this point, so Ray had the option of purchasing his own message board software and installing it on the server, which provided great flexibility, since it was not hosted or managed by anyone but Ray. So PRC now had a vBulletin board. The board really took off by virtue of being linked to PRC, which got tons of hits from being the number one Google search for "Power Rangers". Actors and crew posting began when Doug Sloan got back in the game with Ninja Storm and began posting here. That led to other actors and crew eventually popping in. The vBulletin board continued to grow, and eventually overshadowed PRC. This and the fact that Ray had been toying with abandoning PRC made him give the board its own identity, and so PRC's board spun off onto its own, becoming RangerBoard, complete with its own domain. Still backed by a link from PRC, RangerBoard continued to thrive. With the abandonment of PRC, RangerBoard was all that was left, successfully standing on its own. In February 2010, Ray-Z passes RangerBoard's torch to Decade. Jackie Marchand, "writeranger" - Writer for MMPR to Time Force, then on Ninja Storm, Dino Thunder, Mystic Force, Operation Overdrive, Jungle Fury, & RPM. Bruce Kalish, "B/Boink" - Executive Producer of the following: Power Rangers SPD, Power Rangers Mystic Force, Power Rangers Operation Overdrive, & Power Rangers Jungle Fury. Jack Olesker, "Olesker" - Cowriter of the MMPR Series bible. John Tellegen, "Nikki Valentina" - Writer for Ninja Storm to RPM. Stewart St. John, "Stewart St. John" - Writer for MMPR to Zeo. Brian Ward, "BWard" - Head of the Shout! Factory Power Rangers DVD project. Johnny Yong Bosch, "kermitfries" - Adam from Mighty Morphin Power Rangers, Power Rangers Zeo, & Power Rangers Turbo. Ann Marie Crouch, "Ann Marie Crouch" - Princess Shayla from Power Rangers Wild Force. Sally Martin, "Erana" - Tori from Power Rangers Ninja Storm. Jason Chan, "kengkwin" - Cam from Power Rangers Ninja Storm. Emma Lahana, "emma" - Kira from Power Rangers Dino Thunder. Latham Gaines, "recrem" - Anton Mercer/Mesogog from Power Rangers Dino Thunder. Matt Austin, "Acting like Bacon/WantSomeToast/buttery" - Bridge from Power Rangers SPD. Monica May, "Monica May" - Z from Power Rangers SPD. Samuell Benta, "MYSTER?OUS" - Will, Power Rangers Operation Overdrive. David Weatherley, "davidjohn" - Spencer from Power Rangers Operation Overdrive. Paul Schrier, "Paulie_Schrier" - Bulk, MMPR - Lost Galaxy & Samurai. David Fielding, "BigBlueHead" - Zordon from in the first season of Mighty Morphin Power Rangers. Jessica Rey, "JessicaRey" - Alyssa, Power Rangers Wild Force. VIP Memberships are memberships that are rewarded to members for their generous donations in assisting with the hosting costs. The use of custom avatars, which you may upload. 100x100 pixels. Ability to add a photo album. Ability to manage Visitor Messages. Ability to create and manage up to 2 social groups. Access to the VIP forum. Name changes: 6 months minimum between requests. Ability to upload animated Avatars. While VIP-1 services are still active; the option has been discontinued. It will not be available for new users or for existing users to renew. Multi-Avatars Access. 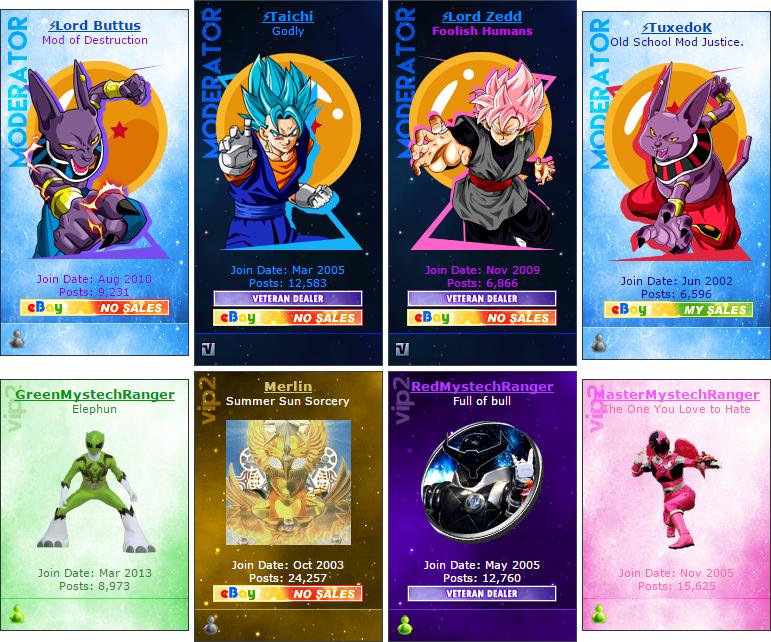 Upload (2) Multi-Avatars (Limited to 150x150 pixels), and a Multi-Avatars background for the profile. Colored Name Options: Fuchsia, Gold, Green, Lime, Orange, Pink, Purple, Silver, Teal & Yellow. Profile Photo can be up to 250x150 pixels. Ability to create and manage up to 5 social groups. Ability to post threads in Advertisements. Name changes: 3 months minimum between requests. Access to Communicator. The communicator continues to work even if RangerBoard is offline during maintenance/repairs. If the database or server crashes, neither the site or Communicator would be online. Access to exclusive board designs. 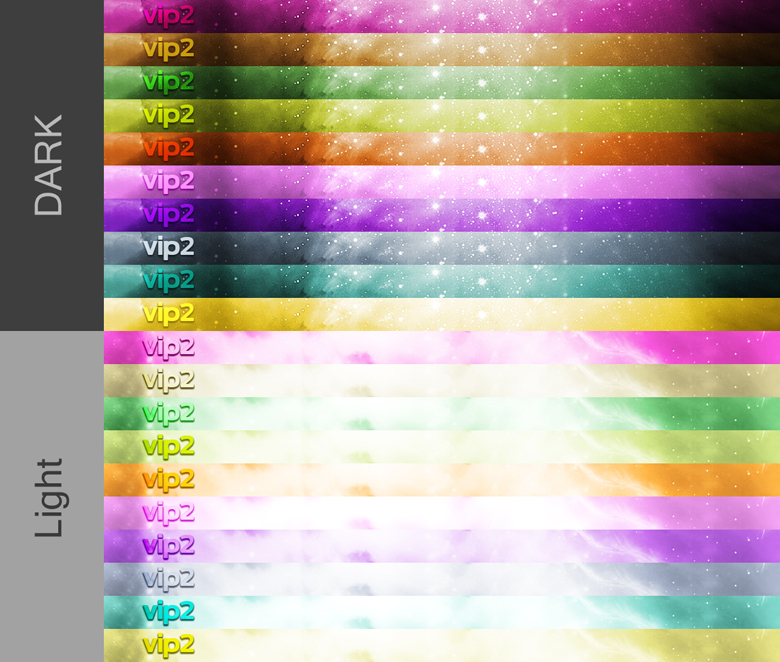 VIP-2 Memberships can be gifted among members. Gifted members aren't automatically notified, so those that send VIP2 as gifts should send a PM. Please note that the VIP status does not elude any post requirements for any type of access on RangerBoard. You can become a VIP-2 Member by making a PayPal donation through the "Paid Subscriptions" section in your User Control Panel. Disclaimer: VIP Memberships are rewards given to members for their generous donations. The money goes towards hosting costs. The donation is non-refundable. The 10 posts is a small level of deterrent to spammers/advertisers looking to quickly advertise off-site sales and never return, it's primarily for the Marketplace. It's being enforced over the Merchandise Discussion section as well because many users in the past wanting to avoid the 10-post limit, instead attempted to buy & sell in the Merchandise Discussion. After receiving 10 posts, you do have to wait a short amount of time. There is an automated server task that runs on the background every 15 minutes. This task upgrades any account that have achieved 10 posts. You will also unlock Private Messaging after gaining 10 posts. Since many users have been caught attempting to deal before they have 10 posts, Private Messaging has been locked until a user has properly gained it. 10 posts is almost nothing to ask from a new member; we're not asking for an arm or a leg from you, it's a small contribution that can be done within the hour and can be easily done without spamming. If you're a Power Rangers, Sentai, or Kamen Rider fan, then discussion should come easily. We have many off-topic threads as well covering Video Games, Anime, and various amounts of other topics. If you're not a fan Power Rangers or any other Toku, and you're simply here to buy & sell, you likely joined the wrong website. In that case, please try eBay instead. Only members with 500 posts or higher can access the Staff Application form. Specific sections like Merchandise Discussions & Marketplace require 10 posts before you can use it. You can easily achieve the requirement by joining existing discussion threads in the General Discussion section. Off-topic discussions are welcomed in the "Discussion" section of the board. A list of administrators and moderators can be seen in the View Forum Leaders section. They are the staff members that run the website/forum. To apply for a possible position, access the Staff Application. Only members with 500 posts or more can access this feature. Signatures have been disabled on RangerBoard. They are useless and annoying. No one on the board including VIP & staff have the privilege of using Signatures. We strongly feel that users have enough creative freedom with the Avatar image & custom user title. In addition, each post are tagged with the user's profile information; in a way, that's a signature. We will not tolerate anyone signing their posts either, from a simple text with just their username to using images. You can change your custom title by editing your profile in the User Control Panel and entering the title in the "Custom User Title" field. Regular members can use up to 75x75 pixels for an Avatar. VIP-2 Members that donate can use up to 150x150. VIP memberships may be purchased through your User Control Panel. Spam filters frequently prevent AOL, Hotmail, and other e-mail systems from receiving messages from Rangerboard. Try turning off your spam filters and checking your "junk" or "bulk" folders. If you still don't receive the validation message, post in the Help Forum for assistance.